When it comes to cafes, you just can’t go wrong with a classic. And, since opening in 1995, it’s fair to say Circus Circus has stood the test of time to become an Auckland classic. So, what’s the secret to its longevity? Enchantment. Let us tell you more! Situated in the heart of Mt Eden Village, the iconic café doubles as a circus—complete with a big top tent, lions and a whooole lot of clowns. You’ll be transfixed as you take in the sights and smells of the bustling café…or should we say circus? Here, chefs magicians whip up hearty, café faves while plates are juggled by waiters clowns. Sound magical? We sure think so, which is why we’ve created this list of reasons you need to visit Circus Circus. Do you dream of escaping the daily grind in favour of joining the circus? Your dreams will come true at this dee-lightful circus-themed café. The café resembles a big top circus tent, painted in bright red with pops of gold. Large lion statues guard the café and, come night, the building twinkles in fairy lights. The theme continues inside with porcelain clowns hanging from from the ceiling and the walls are adorned in old-school circus posters. Is it a café or is it a circus?! Despite what the name might suggest, Circus Circus is, in fact, a café. You won’t find any weird, on-trend food here (activated almonds and fermented kimchi, we’re looking at you). Instead, the café is all about serving good, honest tucker morning, noon and night. We’re talkin’ eggs bene, burgers, chicken wings and—of course—a hearty big breakfast with all the trimmings. Speaking of breakfast, Circus Circus has a strong brunch game. Choose between the likes of mushrooms on toast, blueberry nut granola and three eggs bene offerings—streaky bacon, salmon or pulled pork. For something more lunch-esque, there’s chicken and ‘shroom fettuccine, a steak sammie or the chicken burger. 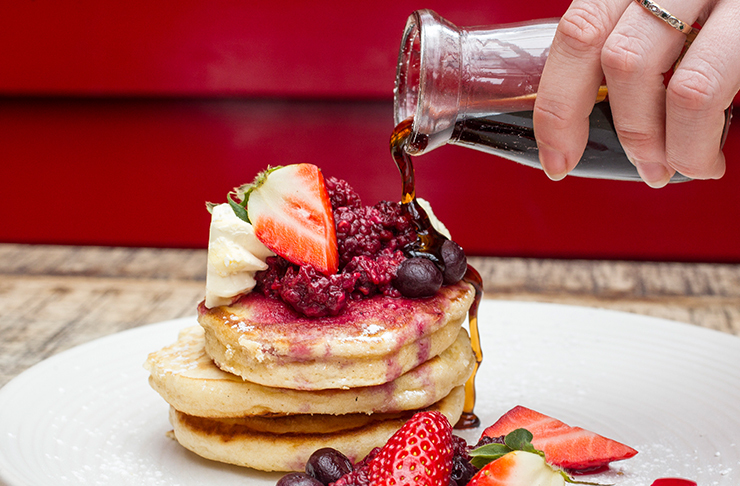 Those with a sweet tooth should opt for their stack of vanilla pancakes served with berry compote, whipped butter and maple syrup—mmm! But the deliciousness doesn’t stop there. No siree! Circus Circus’ dinner is also incredible. Start with an entrée of Vietnamese summer rolls, barbecue pork ribs or an oozing baked brie. Their ‘main event’ menu stars the likes of pan-fried market fish, hand-made gnocchi and a flavoursome beef cheek hot pot pie. If you visit on a Sunday evening, you can nab a hearty roast served with your fave sides. #5 The Littlies Eat For FREE! Not only will the kids (and the young at heart) luuurve the circus theme, but they’ll also love the family-friendly eats. What’s more, kids dine free (yes, free!) between 4.30pm and 6.30pm daily. Go on, take the night off cooking—you deserve it! Circus Circus has a reputation (the good kind) for making the biggest, baddest cakes in town. Their cabinet is brimming with mouth-watering cakes of every flavour: chocolate, banoffee, orange almond and carrot cake with a thick layer of cream cheese frosting. They’re big enough to share but we suggest you #treatyoself and polish that bad boy off yourself. If cake’s not your thing (weirdo), there are plenty of other divine sweet treats at Circus Circus. 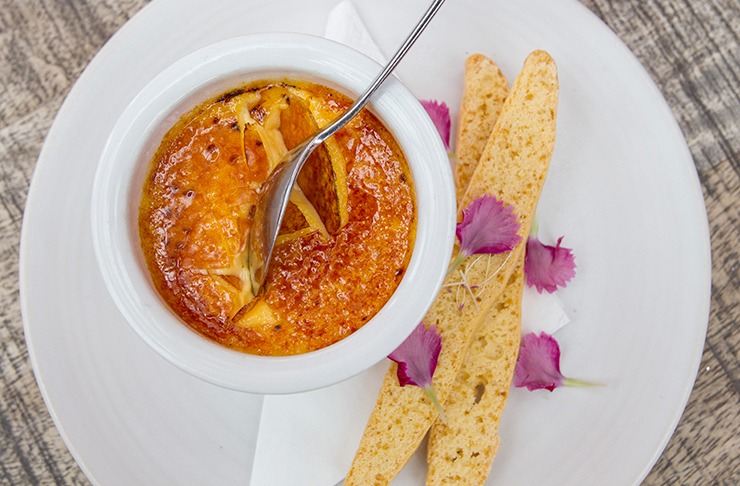 The ‘after the show’ menu features tiramisu, summer fruit crumble, baked vanilla cheesecake and a crème brûlée with a perfectly golden sugar crust—get crackin’! Editor’s note: This article is proudly sponsored by Circus Circus and endorsed by The Urban List. Thank you for supporting the sponsors who make The Urban List possible. Click here for more information on our editorial policy.